Our beloved, Dennis “Elmer” Ray Southerland went home to be with the Lord Thursday April 11 at 5:59 pm. After a long battle with many health issues, he passed away peacefully surrounded by many who loved him at home… and was able to say his goodbyes to those not here by phone. 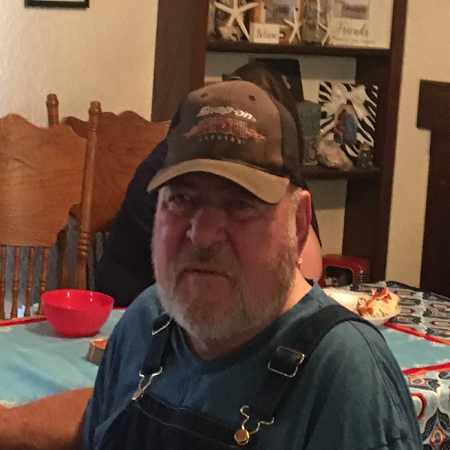 Dennie was a wrecker driver in Cooke County for over 25 years. He and his wife Patricia were married for over 50 years. He will be greatly missed by many. There we be a celebration of his life at a later date. Arrangements are under the direction Meador Funeral Home, Gainesville, Texas. He is survived by his wife, Patricia; son, Brian Southerland of Gainesville; daughter, Jannet Jackson and husband Jeff of Gainesville; daughter, Joyleen Miller and Lisa of Cheyenne Wyoming; Six grandchildren; Two Great-grandchildren; sister, Valerie Thatcher of Clay Center, Kansas; and numerous nieces and nephews. Preceded in death by his parents, Woodrow Southerland and Helen Rock Southerland; step-father, Roy Cowing; brother Brian Keith Southerland; sister, Rosemary Gonzer; and grandson, Daniel Fessler. So sorry to hear of your loss. Prayers for comfort and peace. Psalm 116:8 he has delivered my soul from death, ours eyes from tears, and my feet from falling. Precious in the sight of the Lord is the death of His saints. Numbers 6:24-26 The Lord bless thee, and keep thee. The Lord make His face shine upon thee, and be gracious unto . The Lord lift up His countenance upon thee and give thee peace. I am thankful for the one time I got to meet him many years ago, where I learned how important he was in my sister’s life. Praying for y’all as you go through this time of learning your new normal. He was an amazing man and I am honored that I was able to be his nurse. Y’all are all special to me! We are so sorry for your loss ..love and prayers to your family.